Every family has a legacy, but few have the unique opportunity to celebrate generations of history in the way relatives of Davis and Hazle Buck Ewing did in September. It was then extended family members of the prestigious couple met at Ewing Manor in Bloomington to mark the estate’s 90th anniversary. More than 20 from the family attended, spanning ages and gathering from six states. 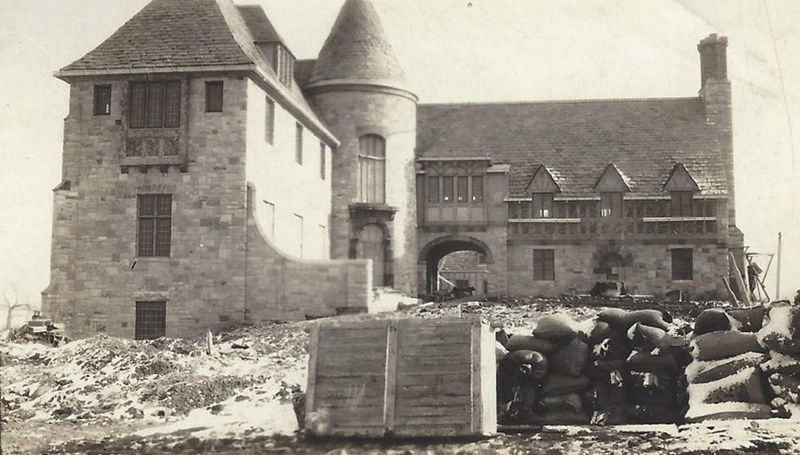 Among them were some who had never visited the manor that was completed in 1929 on what was known as Sunset Hill. Beyond touring the home and reminiscing, the family witnessed the opening of a time capsule that was placed in the home’s cornerstone during construction. maintains the property, which has been restored to the look of yesteryear through the efforts of Toni Tucker. 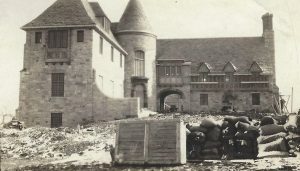 As Ewing’s director, Tucker has worked with family members to bring some of Hazle’s possessions back to the manor that was built on 66 acres at a cost of $178,000. It took 18 months to complete the 8,517-square-foot home that includes 44 rooms. 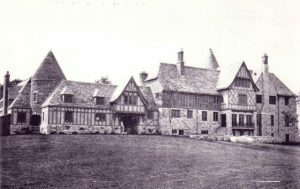 There are three stories to the manor, which was designed based on homes Hazle and Davis visited in England and France. A stable, carriage house and garage are connected to the main residence through interior passageways. Sunset Hill quickly became known as the gathering place for noteworthy guests of Hazle and Davis, who were an elite couple married in 1907. They met in Chicago at a Christian Scientists gathering. Each brought impressive credentials to the relationship. Davis was the son of James Stevenson Ewing, an attorney and U.S. minister to Belgium for President Grover Cleveland. An engineer, Davis started a cement business that created the first sidewalks and streets in Bloomington. Hazle’s father, Orlando Buck, owned the Zeno Chewing Gum Company that impacted the industry through creation of the juicy fruit flavor. Orlando, who patented the foil wrapping placed around individual sticks of gum, merged the company with Wrigley. came through Davis’s paternal grandmother, Maria McLelland Stevenson Ewing. Maria’s sibling, John Stevenson, was the father of Adlai Ewing Stevenson. He served as vice president of the United States under Grover Cleveland. Adlai II was an Illinois governor, United Nations ambassador, and presidential candidate. His son, Adlai III, served as an Illinois senator. The Stevensons were among the many visitors to the manor, which was left to Hazle soon after its construction. She and Davis divorced in 1931. By that time, their adopted son Ralph was an adult on his own. Another boy, Nelson, who was raised as a son, remained with Hazle at Sunset Hill. Julia Hodges, a dear friend of Hazle’s, moved into the home and helped manage the manor. She was so beloved by the family that the children referred to her as their cousin, as did the grandchildren born to Ralph and Nelson. Ralph married Kate Lee. The couple had a daughter in 1941 named Lucinda “Cindy” Buck Ewing. Her home is in Santa Fe, New Mexico. Nelson and his wife, June, added four children to their family. Davis and Philip, both born in 1948, are deceased. Ted is the oldest living child. Born in 1942, he resides in Bettendorf, Iowa. The only daughter, Sandra Hazle (Ewing) Warner, arrived in 1945 and lives in Tucson, Arizona. Ted, Sandra, and Cindy were the closest relatives of Hazle and Davis to return in September for the anniversary celebration of the property that now encompasses six acres and is called Ewing Cultural Center. 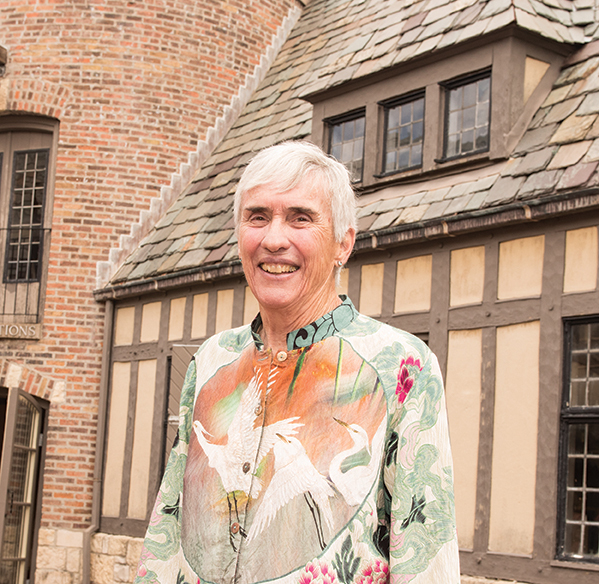 Guests are welcomed for tours and events, including the Illinois Shakespeare Festival each summer. The Genevieve Green Gardens is a reprieve appreciated by all visitors to the property that is used by ISU faculty to engage students in everything from historical architecture to art projects and as a living lab for horticulture majors. The three grandchildren were delighted to see the family keepsakes they had returned to the manor displayed. 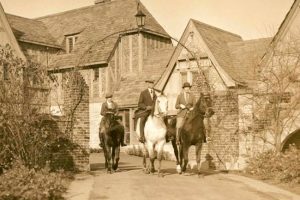 Special memories from the time each spent with their grandmother at Ewing Manor were brought to mind—cherished moments they enjoy sharing and that reflect the grandeur of a bygone era. I did not fully grasp the social and political clout of my grandmother until my young adult years. Both became quickly apparent when Adlai Ewing Stevenson II passed away in July of 1965. He had served as the U.S. Ambassador to the United Nations under President John F. Kennedy, and was a distant relative through my grandfather’s paternal side of the family. across the street from Ewing Manor, family was gathering at the home. President Lyndon B. Johnson was also a guest at the estate. I will never forget arriving at dusk to find my father waiting on the corner of Towanda Avenue and Emerson Street. He identified my car so that officers would let me pass onto the property. Sunset Hill was surrounded by police and FBI agents, with sharpshooters on the roof of grandmother’s house. The lawn was roped off and patrolled by men in dark suits who watched for the media and local citizens trying to get a glimpse of President Johnson. The Ewing and Stevenson families met at the home before arriving at the church, where we all sat together at the front during the funeral. I recall sitting next to Adlai Ewing Stevenson III, who went on to become a U.S. senator from Illinois. It was emotional being next to him during his father’s funeral. What I remember most about the day, however, is seeing President Johnson’s tears. It was during that season of sorrow that I began to comprehend the scope of my grandmother’s influence. There is no question she was a woman respected by leaders of the community, the state and the nation. I look back now and realize how many distinguished people I met as a child during my Bloomington visits. To me, they were just my grandmother’s friends. If only I had paid more attention to the extraordinary individuals who came through the doors of Sunset Hill! Grandmother was a role model for me—from my love of horses and riding to community building, caring for the environment, and a fascination with international relations. She truly shaped my thinking through her belief that if all people could experience another culture, the world could be at peace. This mindset has guided me throughout my life. The various kinds of work that I’ve done, including teaching, were inspired by my grandmother. The same is true of my passion for philanthropy and travel. Just as my grandfather did so many decades ago during his own international adventures, I practice photographing each country I visit. My goal is to make foreign cultures accessible to others who have not had the privilege to explore the world. When I visit Sunset Hill today, I can still see grandmother sitting in her chair in the living room reading the newspaper. She did so each morning, with a blanket placed across her dress and gloves on her hands to avoid ink stains. As she read Bloomington’s paper, The Daily Pantagraph, she would highlight news stories with a red or blue grease pen. This was her reminder to share the article with a specific someone. She often cut them out and mailed them to a family member or a friend, along with some personal notations. I have no doubt each recipient was grateful for the correspondence, even if the news was dated or of little interest. What mattered was the reminder of the relationship with my grandmother. Gifted in bringing individuals together, she was determined to keep both friends and family close. I have so many memories of life at Sunset Hill, but I think some of the most cherished are from Christmas time. Walking in the front door, I would take in the special Sunset Hill Christmas fragrance. Among the most beautiful things to me were fresh garland wrapping the staircase all the way to the top floor of the tower; candy cane striped candles in the candleholders; and tinsel wreaths with a warm electric candlelight in every window downstairs, as well as in the hall windows upstairs. Julia lived in the home and helped grandmother manage the manor. Christmas morning found a wood drying rack to the left of the steps into the living room. There were stockings for each of us filled with simple things like pencils, oranges, walnuts and pecans to crack open later. Cousin Julia put those special treats together every year. I think my favorite gift from grandmother was when she introduced me to horse books by Marguerite Henry—Misty of Chincoteague, Justin Morgan Had a Horse, and so many more. Herman Edwards, the butler and chauffeur, would ring the gong for Christmas dinner at noon. I remember Ruby, Herman’s wife and the family cook, always having a beautiful meal finished off with the family favorite of Woodford Pudding and golden sauce. We had quiet time after dinner till 3, when we would all gather in the living room again. There was time for reading, playing with toys, and family time. Christmas evening was grandmother’s birthday dinner, finished with a birthday cake and “Happy Birthday” sung around the table. 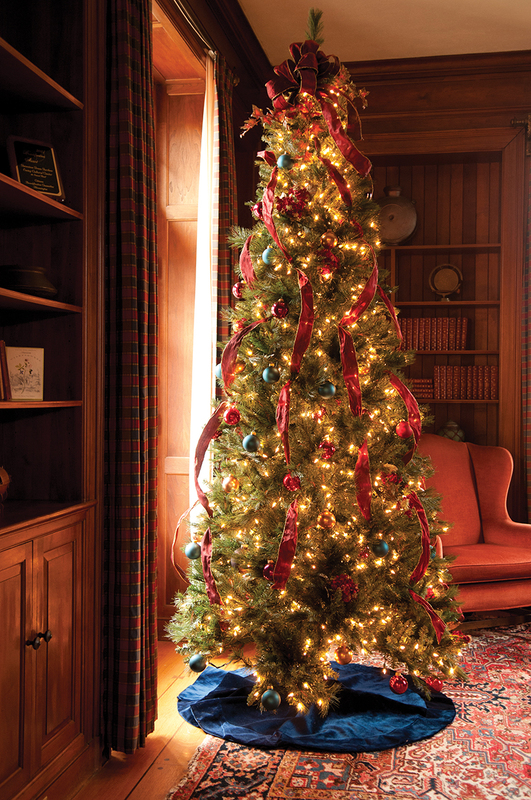 Sunset Hill was the best of the holiday, with a Christmas as grand as that depicted by Courier and Ives, along with Norman Rockwell paintings. When visiting grandmother, our days were organized and fun. My older brother Ted and I were fortunate to spend some of our vacation time at Sunset Hill on a number of occasions. On those weeks, it was breakfast at 8, the Christian Science lesson for the day, horseback riding, mail opening, and The Daily Pantagraph. Grandmother often shared stories with us that she thought we should know about. This was followed with lunch at noon, always announced by a gong Herman rung. Quiet time was from 1-3 p.m., which meant reading in your room or napping, and then an activity before dinner. During my visits grandmother’s good friends, Florence Bohrer and Buffy Stevenson Ives, would arrive for an afternoon of cards. Florence was the first female senator in the Illinois General Assembly and served from 1924 to 1932. To me, she was simply grandmother’s friend. Buffy was a sister to Adlai Stevenson. Of course, I would be properly attired in a dress, socks and Mary Jane shoes—black patent leather flats with straps. I recall feeling quite mature joining the ladies for Canasta in the living room. A card table would be set in the middle of the room, with chairs pulled around. On the table was a card shuffler, which I was allowed to run, with two decks of cards that usually had pictures of horses. A double card holder was in the middle of the table. Cousin Julia always kept the score tablet. Those games were fun, filled with laughter and talk of the game or perhaps friends’ travels or events at the country club. I don’t remember how old I was when I was first taught Canasta, or if I ever won, but I have such happy memories of playing such a grown-up game with the amazing ladies who were so special to me. 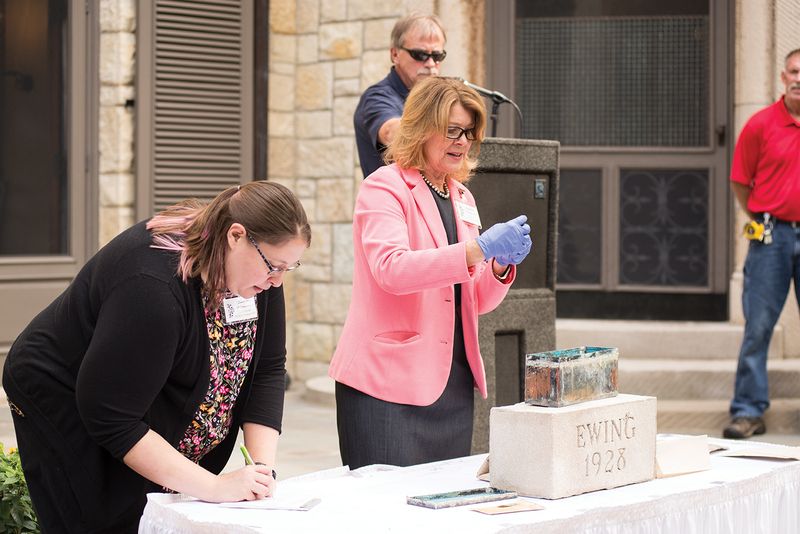 Ewing Director Toni Tucker (right) and Julie Neville of Illinois State’s Dr. Jo Ann Rayfield Archives partnered in revealing the items from the time capsule. For the relatives of the Buck, Ewing, and Stevenson families who gathered at Ewing Manor in September, the opening of a cornerstone placed by Davis and Hazle Buck Ewing was a highlight of a joyful day. They all gathered to watch the removal and opening of a time capsule from a concrete block engraved with Ewing Manor 1928. Ewing Director Toni Tucker and Julie Neville of Illinois State’s Dr. Jo Ann Rayfield Archives partnered in revealing the items that were in remarkably good condition given the decades that have passed. One item deemed most fascinating by the family members was a document presumably written by either Davis or Hazle that chronicled their relationship, beginning with their marriage in 1907. The typed page gave details of the planning for Ewing Manor. Family was equaled intrigued by a faded photo taken as the cornerstone was placed. A copy of the The Daily Pantagraph, Bloomington’s newspaper, was removed. Dated June 11, 1928, the edition had news about President Herbert Hoover’s administration as the front page headline. The rusted copper box held a second newspaper, The Christian Science Monitor, dated June 11, 1928. Proceedings of a Bloomington city counsel meeting from May of 1928 were placed along with coins, including a 1918 half-dollar and an 1890 dollar. By the day’s end, relatives had filled the time capsule that was returned to the cornerstone and sealed back into its original location. Ted Ewing gave a necklace made by his father Nelson. His sister, Sandra (Ewing) Warner, contributed a sealed letter and set of 2018 coins. 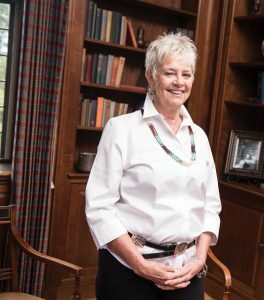 The third grandchild, Cindy Buck Ewing, placed a camera to represent her love for photography, which was also a passion of Davis. Great-granddaughter Monica Gaza selected an iPod with music from 1940 through 2018; Nelson Ewing II added a painting by his daughter Kathryn; and Rose Ewing placed a purple heart earned by her husband and Ewing grandson, Phillip Ewing, from his service in the Vietnam War. Learn more about Ewing Cultural Center at EwingManor.IllinoisState.edu. To inquire about tours or options for hosting an event, including weddings, call (309) 829-6333 or email Ewing@IllinoisState.edu. Susan Marquardt Blystone can be reached at sjblyst@IllinoisState.edu.